On the May 20th, 2015 at the Fonda Theatre in Hollywood, California, the Rolling Stones performed the entire Sticky Fingers album live in concert for the first and so far only time in their career. Although the Rolling Stones’ 2015 “Zip Code” tour mainly played stadiums, they began the trek with a much smaller show at the 1200-capacity Fonda Theater in Los Angeles. In addition to the tiny – for them – setting, the concert came with a novel setlist. Many artists embraced the “complete album” tour in recent years. Bruce Springsteen did well with a “whole River” outing in 2016, and U2 sold out stadiums in 2017 with shows that featured all of The Joshua Tree. The Stones have yet to attempt such a tour, but for one night, they gave the idea a shot. The 2015 Fonda concert allowed them to showcase 1971’s classic Sticky Fingers, so the performance includes all 10 of its songs. Unlike most artists, though, the Stones didn’t play the album in order. The concert opens with 1981’s “Start Me Up” and then launches to 1978’s “When the Whip Comes Down” and 1972’s “All Down the Line”. After that, we get the entire Sticky Fingers album, albeit in jumbled form. Our first song – “Sway” – is the second one on the album, and the final tune we hear – “Brown Sugar” – opens the record. Why shake up the running order like this? I don’t know, but I like it. I’ve been to a bunch of “whole album” shows, and one big negative comes from their predictable nature. For 10-plus songs, we’re stuck with an inevitable setlist, and that can make the shows a little stale, so I like the variety that appears here. Once the Stones finish Sticky Fingers, they play “Rock Me Baby” in honor of the then-recently deceased BB King. The show finishes with 1968’s “Jumpin’ Jack Flash” and a cover of Otis Redding’s “I Can’t Turn You Loose”. Note that three of these songs – “Line”, “Whip” and “Loose” – don’t appear as part of the “main” video program. Instead, they show up as “bonus tracks” on the Blu-ray. Despite that, I wanted to mention their place in the original concert. In addition to the stage performance, Sticky Fingers Live includes some interview snippets between songs. Most of these feature bandmembers Mick Jagger, Keith Richards, Charlie Watts and Ron Wood. We also get notes from possible album cover models Corey Tippin and Joe Dallesandro. Those remarks work fine, but I admit I wish they’d been relegated to the “bonus features” part of the disc. I’d prefer to watch the concert uninterrupted – and the space taken up by the interviews would’ve been better utilized with those three songs left out of the main show. That said, the comments add some informational value. I like the debate about the cover model, and band reflections contribute a bit of useful material, though it’s a little odd to see Wood there since he didn’t join the band until four years after the album’s release. Ronnie does offer some insights into what it’s like to play the songs, though. As for the concert itself, it finds the Stones in good form. While he may not have much to tell us about the album’s recording, Wood stands out as a highlight of the live performance. For a while now, Wood has needed to carry the band in terms of guitar playing. Richards has been on the decline as a musician for years and that leaves Wood as the one who must take charge of that side of the show. An inconsistent performer himself, Wood doesn’t always feel up to the task, but he plays very well during Sticky Fingers Live and contributes real muscle to the songs. I particularly love his work on “Sister Morphine”, as his fierce playing brings out a dark musical edge to the song. Richards does fine as well – he doesn’t excel, but he manages to avoid the flaws that occasionally mar his live performances. The ever-reliable Jagger and Watts hold up their end as well, and this leads to a solid concert. One unusual note: Jagger proves to be much chattier than normal here. I’ve seen the Stones dozens of times, and Jagger rarely says more than “are you feeling good?” and “thank you”. At this show, though, Jagger loosens up a lot. He throws out nuggets about the album as well as the occasional joke. It’s not quite “Garbo speaks” territory, but it’s fun to hear Mick engage with the crowd more than usual. Actually, Jagger seems more invested than usual in general. While always professional, he can go on cruise control during concerts, especially when the band plays a safe “stadium-ready” setlist heavy on warhorse songs. Given the presence of some rarely-played tracks here, though, Jagger appears to enjoy the challenge. He displays a verve and joy often absent from the band’s concerts. That doesn’t mean I don’t always enjoy Jagger at the bigger concerts, but I’ve rarely seen him seem so damned happy on stage. In terms of the home video presentation itself, Moon comes from one flaw: too damned many crowd shots. These subside somewhat as the program progresses, but I still think we find too many of them, and they create a sporadic annoyance. Otherwise, director Paul Dugsdale shows good restraint. The program lacks any visual affectations, and Dugsdale makes no attempt to turn this into a long music video. Editing seems fairly sedate, and this allows us to enjoy the show without cheap, tacky attempts to “enliven” the proceedings - Sticky Fingers Live lets the Stones entertain us all on their own. And it does so pretty well. While I’m not a huge fan of the “whole album” concept, the one-off nature of Sticky Fingers Live makes this an interesting event. The Blu-ray doesn’t present it in a flawless manner, but it’s a largely positive representation of the show. 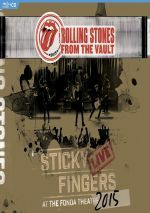 Rolling Stones: Sticky Fingers Live appears in an aspect ratio of approximately 2.35:1 on this Blu-ray Disc. This became a mostly strong presentation. Sharpness worked well. The occasional wide shot could be a smidgen soft, but the majority of the show appeared accurate and well-defined. No issues with jagged edges or shimmering appeared, and edge enhancement failed to appear. As for source defects, I saw no issues in that regard. Like most concert movies, most of the colors stemmed from lighting, and this show took on an unusually blue tint. The hues failed to impress, but they seemed to represent the source well. Blacks were tight and deep, while shadows were positive. A couple of crowd shots seemed a smidgen too dark, but I didn’t mind those; they were inevitable and not a big deal. Overall, the image satisfied. On the other hand, I felt less impressed with the show’s DTS-HD MA 5.1. As we often find for live presentations, much of the audio remained oriented toward the forward channels. In the front, we encountered solid stereo imaging. Vocals stayed nicely centered while the instrumentation spread cleanly across the forward speakers. A staple of Stones music, the dueling guitars each got their own channel, while the rest of the track blended together neatly. Surround usage mainly restricted itself to crowd noise and general reinforcement of the music. However, the track overemphasized those elements, so the cheering often threatened to overwhelm the music. In addition, audio quality disappointed. Vocals tended to seem a little flat and dull, without great clarity. The rest of the instruments failed to stand out in a positive way either. Guitars were tinny, and low-end response lacked much punch. Too much reverb came along for the ride as well, and that left the audio as a messy affair that didn’t allow the songs to prosper. Happily, the disc’s LPCM stereo option fared much better. While it still didn’t boast great bass response, at least it lost the heavy-handed crowd noise – this left us able to actually hear the songs! In addition, the stereo version lacked the oppressive reverb of the 5.1 mix, so the singing and playing all seemed clearer and more natural. It’s still not a great track, but it’s the only listenable option – the 5.1 track flops. The Blu-ray includes three bonus tracks: “All Down the Line”, “When the Whip Comes Down” and “I Can’t Turn You Loose”. These all come from the LA concert – why not include them in the “regular” concert presentation? I have no idea, but I guess it’s better to get them as a “bonus” than not see them at all. The package also includes a CD version of the concert. This provides the entire show – three “bonus tracks” as well – in performance order. It becomes a nice addition, though it omits any form of between-song banter – it needs to cut out non-musical moments to pack all the tracks into one CD. Finally, we find a booklet. It features photos, credits and a Richard Havers essay. It finishes the package well. 44 years after the album’s release, the Rolling Stones performed their landmark record in its entire during Sticky Fingers Live. Despite a handful of questionable production choices, this largely becomes a winning representation of a special concert. The Blu-ray boasts very good picture and decent supplements but skip the awful 5.1 mix and opt for the superior stereo track instead. This turns into an enjoyable show from a band who still rock after more than 50 years.